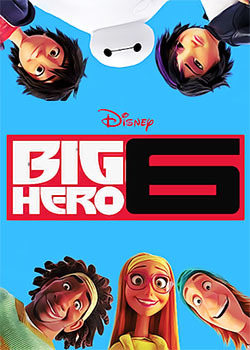 From the moment I saw the first trailer… from the first time I saw the animated Baymax… I was all set to really hate Big Hero 6. I enjoyed the comic from when it first started with Sunfire and Silver Samurai up through when the new characters showed up. The characters introduced for the book were definitely interesting and very different from your regular Marvel teams. But then we look at the trailers and see a while different look at the characters, especially Baymax. I’m actually going to address this movie from two different sides, in comparison to the comics and as an unrelated movie. But, before I do that, I do have to say that the short before the movie about the puppy was incredibly adorable. This movie takes the phrase “loosely adapted from” to a whole new meaning. The 1960s Adam West version of the Batman is more close to an adaptation of Frank Miller’s The Dark Knight Returns than this movie is to the original comic. The movie made the whole thing about science and at a school in some place call San Fransokyo. (Really? They couldn’t decide whether it should be in the US or Japan so they merged cities? UGH!!) The characters come from all sorts of origins and to simplify them all is taking the easy way out of storytelling. The best way to address this is to do so character by character though. Hiro – There’s really not much to Hiro’s character. He’s a genius. One thing tho is that I don’t remember him ever having a brother and he was the one who created Baymax. Hiro was much more serious of a character than he’s made out to be in the movie. Baymax – More than anyone else, they really pissed me off with Baymax. The comic book version of Baymax rocked. He was a synthezoid created by Hiro who had multiple forms. His main form was human looking, allowing him to follow Hiro around as a bodyguard and interact in public. He had 2 battle forms, a dragon and one that was like a mecha. At no point did he ever look like a cross between a balloon and a marshmallow. While the movie version of Baymax is cute, he’s not the formidable construct that I liked and would actually be afraid of if I was on the wrong side of him. GoGo – The character in the comics is actually GoGo Tomago. Her suit didn’t give her powers by making her look like a futuristic roller skater. Her suit caused her to turn into a ball of energy that fired off like a cannon ball with her name being the keyword for it. About the only thing they got right about her being a hero was that the suit was the source of her powers. Also, she wouldn’t be chewing/popping bubble gum. That really toned down the brusque nature of the character tho they did move a little in that direction. Honey Lemon – She was named after tea? REALLY!? *headdesk repeatedly* The character took the name from a TV show. And the purse in the comics was a lot cooler. Instead of a contraption for injecting chemicals into little balls, it actually pulled any item she needed from some other dimension. The source of its power was never explained, but I’ve always suspected it to be mystical like Shaman’s medicine bag. 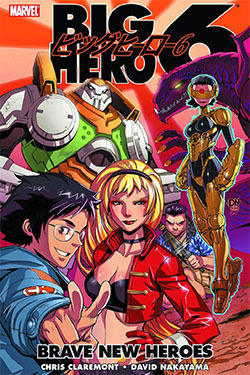 The comic character was kinda fun and a nice counterpart to the seriousness of Hiro and GoGo Tomago, not a flaky smart girl. (I just realized that the movie version reminds me way too much of Sam Sparks from Cloudy with a Chance of Meatballs.) The comic version would be so much more cool and useful. Wasabi – First, the name is actually Wasabi-No-Ginger and the only energy based powers were from personal energy. He was a swordsman as well as the team cook. I’m sorry but there were no lasers or dreadlocks. Like with a lot of the characters, he was a lot more serious in the comics. Fred – They actually made a joke in reference to the cop-out in the film. In the movie, Fred wanted to be able to change into a giant lizard creature. In the comics, he actually does and is called Fredzilla then. In the movie, he simply wears one of the most stupid outfits I’ve ever seen. Seriously. I think he would have been more respectable dressed up as a Teletubby. The costume is actually painful to look at and all he does is bounce around and breathe fire. He’s the only non-student (and, ergo, not overly bright) member of the team. I don’t even know where else to go with this other than to say that the movie character is a joke. As I said, it’s a “loose adaptation”. I dealt with Iceman (the second mutant to join the X-Men) being a student to members who joined the team as he was leaving it. I dealt with Bucky being older than Captain America. I even dealt with Jarvis being a computer system instead of a butler. This has so little to do with the actual comic book that it’s ludicrous though. The travesty of the movie in comparison to the comic book is so extreme that it makes me want to draw and quarter whomever was involved in adapting it. If you loved the comic and want to see it taken to the big screen, make your own version and don’t look at this. OK. How that I got that out of me, let’s try looking at it from the point of view from someone who has never seen the comics and never plans of reading them. The animation style is your standard recent CGI fare. Everything is light, soft, and fun. Everything you need to keep things from being too harsh for a young kid, which is what this seems to be targeted at. Again, I’ll use Cloudy with a Chance of Meatballs and its sequel as a comparable example. Overall, if you’re looking for a cute, fluffy type super-hero movie for your kids, take them to see it. 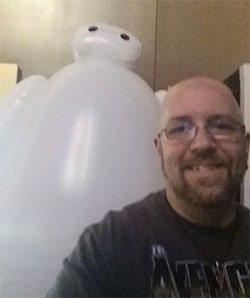 And before you think me too heartless… Yes, even I couldn’t help but take a selfie with the inflatable Baymax out in the lobby afterwards.